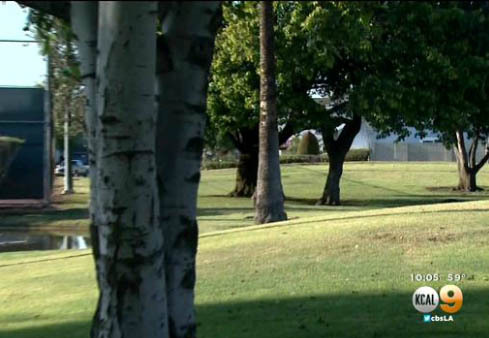 HUNTINGTON BEACH - A 76-year-old Southern California man was punched by an angry father at a park after the older man asked some kids to stop shooting off an airsoft gun near his dog, reports CBS Los Angeles. According to the station, the older man was walking his dog around 8 p.m. May 2 in Le Bard Park, in Huntington Beach. "He didn't want himself or his dog to get hit with the air soft pellets so he asked them to stop. They complied and he continued to walk on," Lt. Kent Ferrin of the Huntington Beach Police Department told the station. He even told police he thanked the boys, about 10 and 12, for complying. However, moments later, he told police he heard a truck's wheels screech behind him, according to the station. That is when the 76-year-old man alleges a white man in his 30s, about 180-200 pounds, got out of the truck and confronted him. The man wanted to know why he was "yelling at my kids" and then punched the senior citizen in the face. The alleged victim tried to walk away but said the assailant came up and punched him, CBS Los Angeles reported. Police said the impact of the blow knocked the older man to the ground. If caught the suspect is facing a charge of felony elder abuse. Huntington Beach Police are asking anyone who may have information about this case to call them at (714) 375-5066.